Download a PDF copy of the Combined Regions Club Events for the year, including dates for General Meetings. More details regarding the time and place of general meetings can be found in the meetings section. Details of contacts can be found in the Committee listing or on the Contact page. 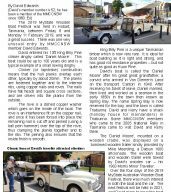 Our Club, MMCCNSW, is affiliated with CMC, who is organising a 6-day tour down the South Coast of NSW, across to Cooma, then on to Albury-Wodonga, from Sunday 22 March 2020 to Friday 4 April 2020. Why? The Australian Historic Motoring Federation is holding their National Motoring Festival in Albury-Wodonga from Sat 28 March 2020 to Fri April 3 2020. Imagine, two weeks of historic car stuff, not just a long weekend. Interested? Contact Lynette Titcume, the CMC Tour Co-ordinator – see flyer, right. 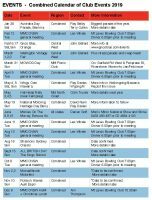 A number of MMCCNSW members have already signed up for the CMC Tour and the AHMF Motoring Festival – they are in training for their two-week ordeal. Download a PDF copy of the details for the CMC Tour 2020. Details of regional contacts can be found in the Committee listing.